In 1956, Bateaux Parisiens inaugurated its boat rides on the Seine in small motor launches until 1987 when the company became a part of the Sodexo group and set a new course. Today Bateaux Parisiens has become an industry benchmark that subscribes to the essential values of the spirit of service, teamwork and progress, values that are shared by the 280-odd staff and a hundred or so seasonal employees it recruits every year. A dynamic and innovative company that participates in a number of promotional events in partnership with the Paris Town Council, the Tourism and Convention Office and the RATP ( Paris region transit operator). Bateaux Parisiens also manages the Batobus shuttle service (close to 900,000 passengers in 2009). Currently the Bateaux Parisiens fleet is made up of 12 panoramic boats, 7 of which are named after stars such as Brigitte Bardot or Catherine Deneuve, and 5 restaurant boats with shining names like The Diamond or The Cristal. 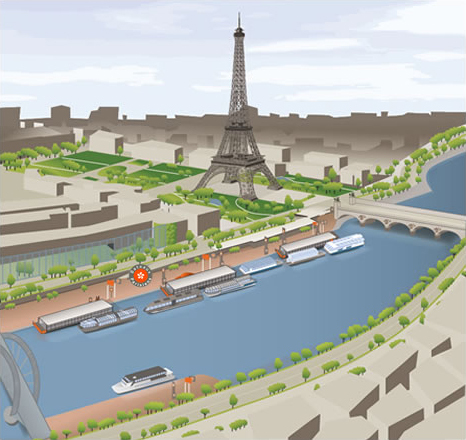 The quality of Bateaux Parisiens cruises, with or without catering, has conquered over 40 % of the Seine market: tourists (36 % of the clientele) and also private individuals, of which 44% are Parisian and companies (20 %). Bateaux Parisiens cultivates the art of receiving and enables some 3.5 million passengers per year to discover the Paris of Parisians!